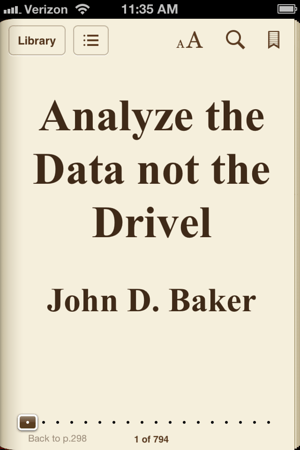 EPUB | Analyze the Data not the Drivel. If you have worked through the exhausting procedure of converting your blog to LaTeX: see posts (1), (2) and (3), you will be glad to hear that turning your blog into an image free eBook is almost effortless. In this post I will describe how I convert my blog into EPUB and MOBI eBooks. eBook readers like Kindles, Nooks, iPads and many cell phones are optimized for plain old prose. They excel at displaying reflowable text in a variety of fonts, sizes and styles. One eBook reader feature, dear to my old fart eyes, is the ability to increase the size of text. All eBooks are potentially large print editions. There are other advantages: most readers can store hundreds, if not thousands of books, making them portable libraries. It’s now technically possible to hand a kindergarten student a little tablet that holds every single book he will use from preschool to graduate school. The only obstacle is the rapacious textbook industry and their equally rapacious eBook publishing enablers. But fear not open source man will save the day. The days of overpriced digital goods are over! I will never pay more than a few bucks for an eBook because I can make my own and so can you! Let’s get together and kill off another industry that so has it coming! Native eBook file formats like EPUB and MOBI do not handle complex page layouts well. If your document contains a lot of mathematics, figures and well placed illustrations stick with PDF workflows. You will save yourself and your readers a lot of grief. But, if your document is a prose masterpiece, a veritable great American novel, then “publishing” it as an EPUB or MOBI is great way to target eBook readers. EPUBs and MOBIs can be compiled from many sources. I start with the LaTeX files I created for the PDF version of this blog because I hate doing the same boring task twice. By far the most time-consuming part of converting WordPress export XML to LaTeX is editing the pandoc generated *.tex files to resolve figures and fix odd run-together-words and paragraphs. To preserve these edits I use pandoc to convert my edited *.tex to *.markdown files. Markdown is a very simple text oriented format. A markdown file is completely readable exactly the way it is. All you need is a text editor. Even text editors are overkill. You could compose markdown with early 20th century mechanical typewriters; it’s a low tech format for the ages: perfect for prose. and to track changes to my markdown files I GIT this directory. MarkdownFrLatex strips out image inclusions and removes typographic flourishes. When it succeeds it writes a simple markdown file and when it fails it writes a *.baddown file. Baddown files are *.tex files that contain lstlistings and complex figure environments that are best resolved with manual edits. After removing such problematic LaTeX environments the J verb FixBaddown calls pandoc and turns baddown files into markdown files. You can read the resulting EPUB file bm.epub on any EPUB eBook reader. Here’s a screen shot of bm.epub on my iPhone. The last step converts bm.epub to bm.mobi. MOBI is a native Kindle format. Pandoc can generate MOBI from bm.markdown but it inexplicably omits a table of contents. No problemo: I use Calibre to convert bm.epub to bm.mobi. 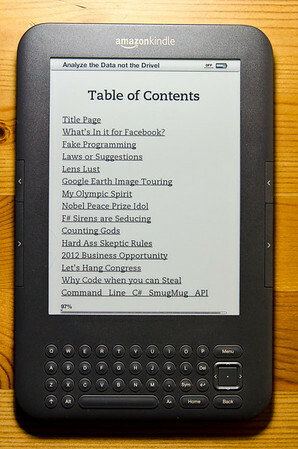 Calibre properly converts the embedded EPUB table of contents to MOBI. Here’s bm.mobi on a Kindle. All the “published” versions of this blog are available on the Download this Blog page so please help yourself! LaTeX is usually compiled to PDF making it one of hundreds of PDF workflows.